From top clockwise: (1) Mahajati Sadan, the historical theatre for the show, (2) Rtn. 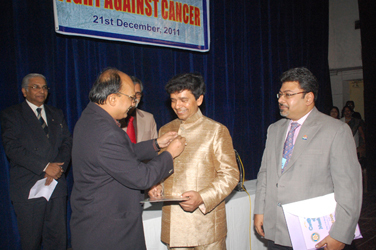 Angshuman Bandyopadhyay, District Governor of Rotary International District 3291 attaches Rotary Club button on Manick Sorcar during inducting him as an Honorary Rotarian. Rtn. 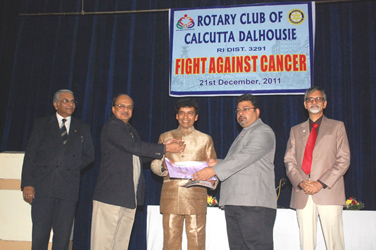 Debashis Bhattacharya, current President of Rotary Club of Calcutta Dalhousie, and on left is Rtn. Santanu Ghosh, (3) From left: Rtn. Santanu Ghosh (MC of the session), Rtn. Angshuman Bandyopadhyay, Manick Sorcar, Rtn. Debashis Bhattacharya, and Rtn. Rajani Mukherjee, District Governor Nominee for Rotary Year 2013-14. 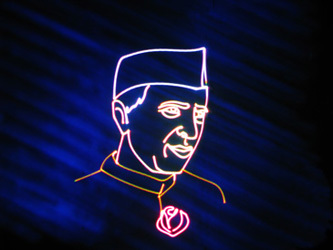 (4) Jawaharlal Nehru in a scene from "Our Republic's Birth"
At the request of Rotary Club of Calcutta Dalhousie, a special Manick Sorcar laser show was held on this day to raise funds for the construction of a health care centre for cancer patients in Bankura, West Bengal. 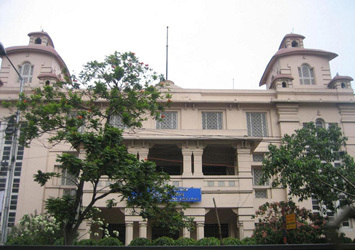 The two-hour show took place at the historic Mahajati Sadan theatre on Central Avenue, Calcutta. Prior to the show a 20 minute reception-meeting welcoming the honorable guests was conducted by Rotary Club of Calcutta Dalhousie. Manick Sorcar was felicitated and inducted as an Honorary Member of the club. District Governor of Rotary International District 3291, Rtn. Angsu Bandyopadhya attached the Rotary button on Manick’s suit. Over the years Rotary Club of Calcutta Dalhousie has been active in doing humanitarian services across the state including building sanitation in the villages, vocational training for girls on stitching, knitting and embroidery, pre-school training center for the children of slum dwellers, education for girls up to class XII, etc. Manick Sorcar’s show was for raising funds for the construction of the palliative care center at Kotalpur, Bankura. The sold out show made a significant contribution to that goal.